The stock market wasn't too thrilled about it, either, although there wasn't a concerted selling effort on the part of the bears. The major indices were down for the week, but the tech sector continued to show resilience with semiconductors in the leadership position. There was a suggestion in the press last week that the stock market "couldn't care less" about Obamacare, and perhaps that's true. But there's one thing that will be seriously impacted by the lack of Obamacare reform and that's the middle class economy. Performing a postmortem of a failed political reform effort is seldom a gratifying task, but in this case there are a couple of things that need to be addressed. From the start, the mainstream press tried to control the debate by constantly reminding everyone of the 24 million Americans who stood to lose coverage should Obamacare be repealed. Never mind that is only about eight percent of the entire U.S. population, hence an extreme minority. In a representative-style democracy such as ours, public policy is supposed to benefit the majority -- not the minority at the expense of the majority. What too many pundits have failed to consider in their treatment of the Obamacare debate is that the legislation which mandates health insurance for Americans is at root a personal liberty issue. It's not about providing free (or cheap) coverage for the needy or the underinsured. The main issue, which seemed to escape most commentators, is that Obamacare is a form of redistributive economics: socialism in its essence. Obamacare represents the government putting the proverbial gun to the individual's head and saying, "You will buy health care whether you need it or not...or else!" I found it shocking that Obamacare was passed in the first place with little of the impassioned protest among individuals which characterized the first attempt at establishing socialized medicine in America (in 1993). Even more surprising was the limp-wristed effort with which the current Congress failed to address the underlying problem with Obamacare, viz. the individual mandate. An easy solution to the Obamacare reform debate would have been to simply eliminate the individual mandate and leave everything else intact. This would have highlighted the single biggest problem with the legislation while avoiding direct confrontation from those who insisted that Obamacare not be entirely repealed. Aside from personal liberty considerations, the other main consequence of leaving Obamacare intact is that it does nothing to alleviate the problems faced by individuals and small business owners who are forced to shoulder the burden of expensive healthcare coverage or else pay a hefty penalty. One of the big reasons why the current economic recovery since 2009 has been the slowest on record is because of the exorbitant tax and regulatory burden imposed by Washington in the wake of the credit collapse. Rather than remit taxes, the tried-and-true palliative for getting out of recession, the Washington establishment did the exact opposite. No wonder then that Middle America has struggled to restore its financial condition ever since the housing bust laid waste to it some 10 years ago. 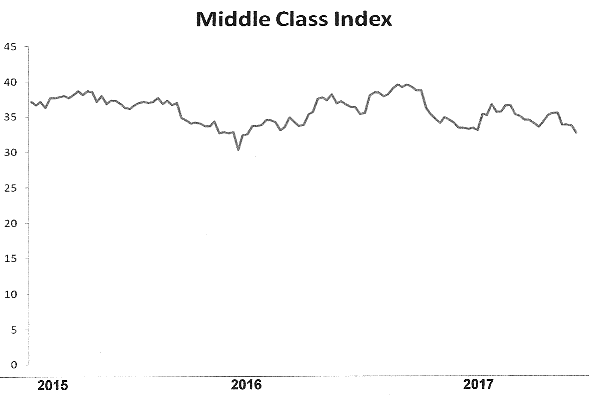 If you want to see just how the middle class business economy is doing right now, take a look at the following graph. It combines the stock prices of some of the leading U.S. publicly traded companies which cater primarily to the average American. As you can see, it's hardly a picture of health and prosperity. Had Congress signaled its sympathy with middle class struggles by remitting the Obamacare taxes, there would almost certainly have been a strong consumer spending boom in its wake. Lowering taxes always has a stimulative effect, and there's no better way to facilitate economic health than to make it easier for individuals and businesses to spend more of their hard-earned dollars into the economy than by letting them keep more of it. Failure to lift the burden imposed by Obamacare means that the millstone remains tied firmly around the necks of millions of Americans. It also means the economy won't be returning to a vigorous state anytime soon. The failure of the Obamacare reform attempt also paves the way for the continued dominance of financial engineering in steering the economy. Congress let slip an opportunity to regain the control over the economy that it surrendered to Wall Street and the Federal Reserve in the wake of the credit crash. Instead of economic healing via fiscal stimulus and tax remittance, the economy will for now continue to be dominated by financial sector and central bank policy. Any economic improvement from here will likely be due to the trickle-down effect of a rising stock market. The direct stimulating effect of Congressional tax policy would have been far preferable. While the tone of this article might be construed as fatalistic, by no means should it be assumed that the die is cast. There's still a chance, however remote, that the Congress will come to its senses in time to at least address some aspects of tax reform before the 2018 mid-term election. By failing to seriously address one of the leading issues facing the middle class economy, however, Congress has telegraphed the message that it lacks sympathy with the majority of U.S. taxpayers. An overnight change in this attitude would seem unlikely. Most books in the financial genre tend to be, quite frankly, boring. Books on the subject of stock market speculation are prime culprits of this tendency toward the tedious. Every now and then, though, a book appears which breaks out of this mold and is truly as entertaining as it is educational. Such is the case with Dave Harder and Dr. Janice Dorn's recent book, Mind, Money & Markets. The fruit of their collaboration is a useful guide for investors, traders, and business people and is rich in examples of how psychology influences markets. Dr. Dorn is imminently qualified to address this subject as she is a Board certified psychiatrist as well as a long-time investor and investment writer. Mr. Harder also brings long experience as an investment adviser and is currently vice president and portfolio manager with Canada's largest financial firm. The decades of experience between them provides the reader with a far deeper insight into investor psychology than is available in most works on the subject. I personally found Mind, Money & Markets to be an engaging and insightful read. At over 400 pages, there's a lot of info to digest but the writing is smooth and the chapters seemed to fly by. The book is richly illuminated with many colorful charts and illustrations and is lively with many accounts of how psychology influenced the financial market debacles from the distant pass to the present. Chapter 6 affords the reader with an in-depth discussion of market trends and momentum and is alone worth the price of the book. There are also chapters dealing with the cycle of investor emotions, emotional management, identifying market tops and bottoms, and portfolio management. Chapter 28 entitled, “It Is Time for a Revolutionary Change in Portfolio Management”, is also worth the price of admission. I heartily commend Mind, Money & Markets as a worthy addition to every trader/investor's library. The book is available from Amazon.com.